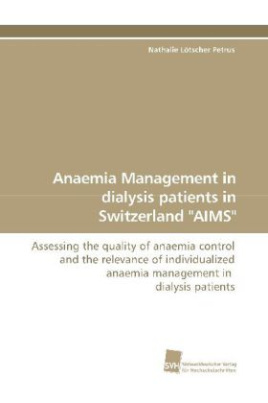 Anaemia Management in dialysis patients in Switzerland "AIMS"
The survey, AnaemIa Management in dialysis patients in Switzerland, called "AIMS" was the first survey performed in Switzerland assessing current anaemia management in dialysis patients after the edition of the EBPG. The objectives of the survey were to assess the quality of anaemia management and to compare it with current guidelines. Anaemia management in respect of the patients' clinical condition was investigated in comparison to the recommendations of the guidelines. Likewise, it was assessed whether physicians individualize anaemia management according to the patients' clinical condition. The survey "AIMS" represents a simplified tool to perform quality assessments of anaemia management in dialysis patients which facilitates long-term evaluations and quality controls of chronic kidney disease patients. Further algorithms might be integrated with the aim to provide guidance and support in clinical decisions for physicians in order to improve and individualize patient care. Bitte schreiben Sie uns Ihre Meinung zu: Anaemia Management in dialysis patients in Switzerland "AIMS"